POWA Excellence in Craft Award winners presented at the Spring Conference banquet on May 14 were: front, from left – Tom Tatum, Alex Zidock, Charlie Burchfield, Linda Steiner, Bob Steiner and Wade Robertson; Back – Tyler Frantz, Gerald Putt, Marshall Nych, Ben Moyer, Bob Frye, Tim Flanigan and Mark Nale. Not pictured are Michael Huff and Joe McDonald. The Pennsylvania Outdoor Writers Association presented the annual Excellence in Craft Awards during its Spring Conference banquet at the Best Western Grand Victorian Inn in Sayre, PA on Saturday, May 14, 2016. 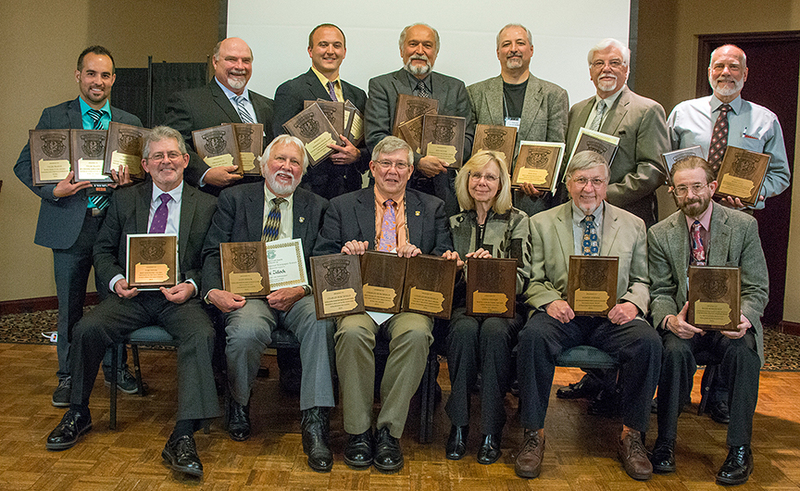 Awards Chair Brad Isles distributed first-place awards to 15 individuals in 27 categories. There were nearly 300 total entries by almost 40 members. 1. Best Newspaper Column (sponsored by Bob & Linda Steiner) – “Thoughts on the ‘Cecil Effect’” by Tom Tatum, published in The Daily Local News on Aug. 12, 2015. First runner-up – “’Unified’ PGC board appears intent on fewer opportunities” by Doyle Dietz, published in The (Pottsville) Republican-Herald on March 15, 2015. 2. Best Newspaper Feature (sponsored by Pennsylvania Hunters Sharing the Harvest) – “Rise of the Coyotes” by Bob Frye, published in the Pittsburgh Tribune-Review on March 1, 2015. First runner-up – “An October ‘lullaby’ lays big buck to rest” by Tyler Frantz, published in the Lebanon Daily News on Oct. 25, 2015. 3. Best Magazine or Regional Newspaper Column (sponsored by Gogal Publishing Co.) – “Sweet Sixteen and Duct Tape” by Marshall Nych, published in Pennsylvania Outdoor Journal, April 2015. First runner-up – “’Success Syndrome’ complicates conservation” by Ben Moyer, published in Pennsylvania Outdoor News on Sept. 11, 2015. 4. Best Magazine or Regional Newspaper Feature (sponsored by Blackpowder Products Inc.) – “Lasting Decision” by Tim Flanigan, published in Pennsylvania Game News, July 2015. First runner-up – “The Town Under Lake Wallenpaupack” by Alex Zidock, published in Pennsylvania Angler & Boater, November/December 2015. 5. Best Published Newspaper Photo, Color or Black & White (sponsored by POWA Past Presidents) – “Rockies have ‘Wow’ factor” by Bob Steiner, published in The (Oil City) Derrick/The (Franklin) News-Herald on Sept. 11, 2015. First runner-up – “Trout Rules Getting Look” by Mark Nale, published in the Centre Daily Times on Dec. 13, 2015. 6. Best Published Magazine Photo, Color or Black & White (sponsored by POWA EIC Entries) – “Raccoon Reflection” by Joe McDonald, published in Nature Photographer, Fall/Winter 2015/2016. First runner-up – “Black Bear and Cub” by Tim Flanigan, published in the 2015 Pennsylvania Game Commission wildlife calendar. 7. Best Radio/TV Program Award (sponsored by POWA EIC Entries) – “Top Shot Shooter Chris Cheng” by Charlie Burchfield, Gateway Outdoors broadcast on Nov. 2, 2015. First runner-up – “Jacobsburg Rendezvous” by Alex Zidock, Out in the Open broadcast on Dec. 10, 2015. 8. Best Published Art Award, Color or Black & White (sponsored by GATCO Sharpeners/Timberline Knives) – “Real Game Savers – Chessie” by Gerald Putt, Pennsylvania Game News cover, November 2015. 1. NRA Best of the Best Award (sponsored by the National Rifle Association) – “Top Shot Shooter Chris Cheng” by Charlie Burchfield, Gateway Outdoors broadcast on Nov. 2, 2015. 2. POWA Pass it on Award (sponsored by POWA EIC Entries) – “Palmyra Middle School students get an outdoors education” by Tyler Frantz, published in the Lebanon Daily News on June 7, 2015. First runner-up – “Fingerling release” by Ben Moyer, published in The Herald-Standard on May 10, 2015. 3. Wildlife Conservation Partnership Award (sponsored by the Pennsylvania Game Commission) – “Voyage of Discovery” by Bob Frye, published in the Pittsburgh Tribune-Review on Aug. 16, 2015. First runner-up – “It’s a near-record year for bird species count” by Tyler Frantz, published in the Lebanon Daily News on Jan. 25, 2015. 4. Hawk Mountain Sanctuary Raptor Conservation and Eco-Tourism Award (sponsored by Hawk Mountain Sanctuary) – “A Trip to Hawk Mountain” by Wade Robertson, published in The Olean Times Herald on Sept. 20, 2015. First runner-up – “Where Was Irma?” by Mark Nale, published in the Centre Daily Times on July 26, 2015. 5. The Pennsylvania Elk Resource Award (sponsored by the Keystone Elk Country Alliance) – “Elk on the Alleghenies” by Ben Moyer, published in Pittsburgh Quarterly, Summer 2015. First runner-up – “Interest in elk continues to grow in state” by Bob Frye, published in the Pittsburgh Tribune-Review on Oct. 25, 2015. 6. Best Action Hunting, Trapping or Fishing Photograph (sponsored by POWA EIC entries) – “Banner day of bear hunting near creek” by Tyler Frantz, published in the Lebanon Daily News on Dec. 6, 2015. First runner-up – “Spark, Smoke, Boom” by Ben Moyer, published in The Herald-Standard on Jan. 4, 2015. 7. Best Conference-Related Material Award (sponsored by POWA EIC entries) – “BYOB whitewater adventure on Somerset County’s Stoneycreek River” by Mark Nale, published in The Daily Herald on June 23, 2015. First runner-up – “Bike-fishing the Youghiougheny tells a river’s story” by Tyler Frantz, published in the Lebanon Daily News on May 24, 2015. 8. Best Published Pennsylvania Fishing Or Boating Related Newspaper Photo, Color Or Black & White (sponsored by the Pennsylvania Fish & Boat Commission) – “Trout Rules Getting Look” by Mark Nale, published in the Centre Daily Times on Dec. 13, 2015. First runner-up – “BYOB Whitewater adventure on Somerset County’s Stoneycreek River” by Mark Nale, published in The Daily Herald on June 23, 2015. 9. Handloading Promotion Award for Broadcast Media (sponsored by Redding Reloading) – “Reloading 101” by Alex Zidock, Out in the Open, broadcast on April 2, 2015. First runner-up – “Tips and Techniques for Handloading” by Charlie Burchfield, Gateway Outdoors, broadcast on Nov. 9, 2015. 10. Handloading Promotion Award for Electronic Media (sponsored by Redding Reloading) – ‘Best Bullet for Predator Hunting? (Part 3: Hollow Point Bullets), by Michael Huff, published at www.coyotelight.com. 11. Handloading Promotion Award for Print Media (sponsored by Redding Reloading) – “Winchester ’53: a special gift that will live on in family” by Charlie Burchfield, published in The Courier-Express on Oct. 4, 2015. First runner-up – “Robertson: Favorite hand loads” by Wade Robertson, published in The Bradford Era on Jan. 8, 2015. 12. Outdoor Blog Entry Award (sponsored by POWA EIC entries) – “A New Brother” by Marshall Nych, published at www.bucktailoutdoors.com in May, 2015. First runner-up – “Ben Moyer sets off into the Youghiougheny Gorge in search of native trout” by Ben Moyer, published at www.NatureConservancy.org. 13. Pennsylvania Trappers Award (sponsored by the Pennsylvania Trappers Association) – “Modern-day mountain man” by Ben Moyer, published in The Herald-Standard on Feb. 15, 2015. First runner-up – “Lessons learned on a bobcat trapline” by Ralph Scherder, published in American Trapper, September-October 2015. 14. Trout and the Coldwater Resource Award (sponsored by Pennsylvania Council of Trout Unlimited) – “Class A Fray” by Ben Moyer, published in the Pittsburgh Post-Gazette on Jan. 18, 2015. First runner-up – “Trout telemetry study begins on the Little Juniata River” by Mark Nale, published in The Daily Herald on April 28, 2015. 15. White-Tailed Deer Award (sponsored by POWA EIC entries) – “First Friday Gooner” by Linda Steiner, published in Pennsylvania Game News, December 2015. First runner-up – “One final adventure” by Bob Frye, published in the Pittsburgh Tribune-Review on Dec. 27, 2015. 17. Young Trees Habitat Award (sponsored by the Allegheny Chapter of the Ruffed Grouse Society) – “State Game Lands benefit from controlled fires” by Tyler Frantz, published in the Lebanon Daily News on June 14, 2015. First runner-up – “Improving food and cover for wildlife” by Charlie Burchfield, published in The Courier-Express on Jan. 18, 2015. 18. Youth Fishing Award (sponsored by Expositions, Inc.) – “Mining Memories” by Marshall Nych, published in Coal People Magazine, December 2015. First runner-up – “Some Angling Angst Possible on Trout Season’s Opening Day” by Tom Tatum, published in The Daily Local News on March 31, 2015. 19. Youth and the Hunting/Shooting Sports Award (sponsored by the National Shooting Sports Foundation) – “Going Home Early” by Marshall Nych, published in Pennsylvania Game News, April 2015. First runner-up – “Hunting, Heritage, and Heart” by Joe Byers, published in Whitetails Unlimited Magazine, Summer 2015.